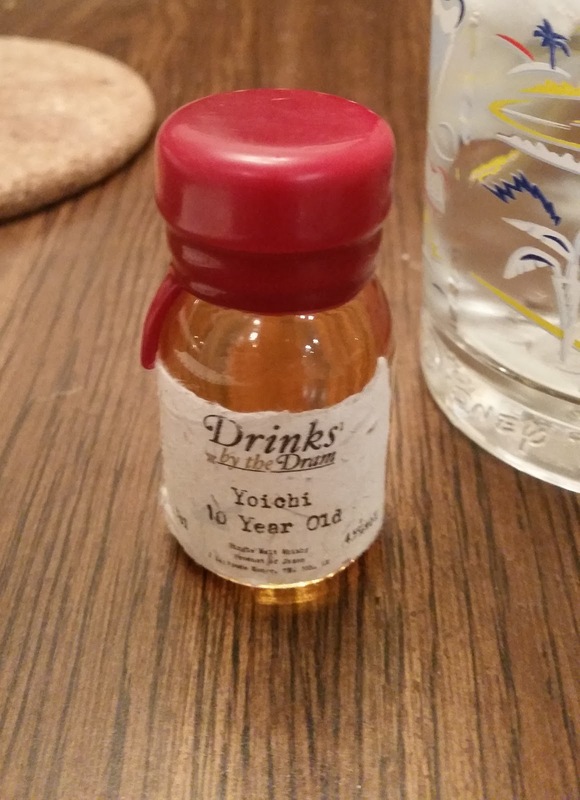 This bad boy represents my first foray into the world of Japanese whiskey and- my first time sampling one of the awesome products of Drinks By The Dram. Exactly what it sounds like, these mini dudes arrive in this compact, waxed sealed little containers (this one came from across the Pond from my Uncle after a recent Parental visit) and live up to their name perfectly. It was the perfect dram of whiskey- not too much, not too little, pretty much the perfect amount to get a good sense of what the whiskey is about and what it tastes like. This particular dram is the Yoichi 10 Year Old Single Malt, which Master of Malt hails as "the jewel in Nikka's crown," The company dates back to 1934- but the founder Masataka Taketsuru went to Scotland all the way back in 1918 to learn the craft for a couple of years before returning to Japan to join Kotobukiya, which is now Suntory. (Yes, that Suntory.) The company is headquartered in Tokyo, but the Yoichi Distillery is located in Yoichi, Hokkaido, which is the northernmost island of Japan. Color: Pale yellow/golden. It's not dark at all, but it took a pretty decent examination on my part to land on a color. From the side of the glass, it looked darker than it was when I held it up to the light and looked through the bottom of the glass. Aroma: It's very light. Lots of vanilla- there's an underlying note of fruit here as well, but I'm not sure what. I want to say figs, but it feels a little too crisp for that. Possibly melon? Body: Nicely balanced- it's not too syrupy and not too watery- the MoM review uses the descriptor 'oily' which is probably more accurate. There's some smoke in the taste- as well as hints of something harsh that seems like it could be citrus peel. No spice, which is surprising, given the notes of vanilla in the aroma. Finish: Hits the back of the throat first- it's harsh, but not unpleasantly so. Overall: I'm a little hesitant at pronouncing a verdict- I did this tasting on the back half of a cold, so I might have to revisit this at some point in the future to see if my impressions were correct or not. I do want to dip into Japanese whiskey more and there's a lot to like about this whiskey. The aroma was light, the texture perfectly balanced, but the finish left something to be desired. I did like the touch of smoke in the taste- it's subtle and not overwhelming in the way a lot of the Islays can be. My Grade, a solid B+ but with an asterix. I need to find more Japanese whiskey and revisit this in the future.